An optional driver license scanner add-on is available. 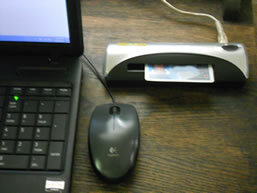 This module is $495 and includes a 2D barcode or magnetic strip scanner shown here. If you are having trouble keeping up with bidder registration before the sale the Driver License Add-On is your answer. Insert a driver license and click 'scan driver license'. LiveAuctionIT will scan the 2D barcode on the back of the bidder's driver license and automatically fill out the Add Bidder page. Just click 'Add' and your bidder is registered for the auction.